27/04/15 – Mat Allen passes on G64 image of master disk! 28/08/14 – Mat Allen passes on photo of disk. Dump to follow! 24/08/14 – Mat Allen confirms that there was a master disk leaked (he owns it!) .. coming soon to GTW64 at some point in the form of scans + dump. 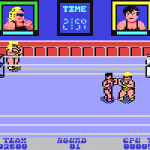 Body Slam was a Sega arcade game which featured female wrestlers doing battle in the ring. 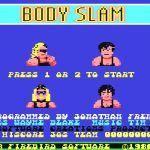 It was fairly obscure, not not obscure enough for Firebird to take up the licence it seems with Software Creations behind the work. 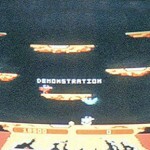 A conversion was completed by Jonathan French, who converted Agent X 2 to the C64 previously, with Wayne Blake (Mermaid Madness, Psycho Pigs UXB, Raw Recruit) on graphics and Tim Follin on music. Oddly though, the game doesn’t seem to have ever got a full release – though it has existed on the scene for many years for download. 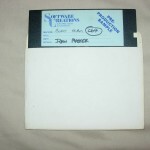 Richard Hewison of the Bird Sanctuary website believes that the game was earmarked for released on the new Silverbird label (in the same way that Atari’s Peter Pack Rat was, also written by Software Creations). For reasons unknown, it never happened. Maybe the licence fell through? 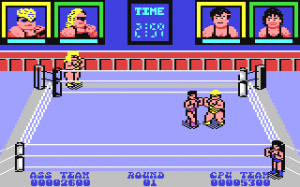 The game never got a conversion for the other 8-bits, so this seems to have been a C64 exclusive, though variants of the arcade did appear on the Master System – but was nothing to do with Firebird or Software Creations. Interestingly, collector Mat Allen found a master disk some time back – and has dug out and created a G64 image of it for the archives, which you can find in the download links. Just why didn’t the game get a release? Here it is anyway – we hope to hear from Jonathan French at some point to confirm what happened. Watch this space! eBay auction! Something nags in the back of my head I bought it from someone who worked at Software Creations, might have been Ste Ruddy, or one of the Follins. I was going to say, was it Ste? He did at one point sell a bunch of his old stuff. I must admit, I thought this game was already on the website, as I was 99% sure it was never released. I’ve got a disk of this somewhere in my pile, went to go find it. Has a Software Creations label on it, and “raw master” written on it. I may have already dumped it way in the past, I’ll have a look. If not, I’ll do it again, and try to take a photo/scan of the disk. Not sure why we hadn’t added it earlier to be honest. That would be great Mat if you could dig out the disk and provide any scans (or even a dump). Can you recall where you got the disk from?